For many american’s, the Presidency of Donald Trump has been exasperating. For many, their aren’t any penalties for his misdeeds. The reality he has been checked. There are literally hundreds of cases awaiting a court date. However, Americans saw a rare about face from the President, after recordings and images of small children crying outraged the nation and the world. In an attempt to honor two campaign promises, the president has limited the number of immigrants attempting to cross the border from Mexico and was hoping to force the democrats to agree to a new immigration bill that would include money for a border wall. On Wednesday Donald Trump, signed a national an executive order designed to keep migrant families together at the U.S. Mexican border. Abandoning his earlier claim that the crisis was caused by an iron-clad law and not a policy that he could reverse. In Trump’s new executive order, the defense secretary is instructed to take all available measures to provide to the Department of Homeland Security any existing facilities for the housing and care of “alien families” or to build them if necessary. The challenge for the government is locating the children. Who were separated from their families without paper work and relocated in some cases thousands of miles from the border. Don’t throw away your signs! The Executive order was for just for the cameras. The new order will allow immigrants to be sent to military bases. Yesterday, the New York Times reported the US is preparing to shelter as many as 20,000 migrant children on four American military bases, to carry out President Trump’s order to keep immigrant families together after they are apprehended at the border. On Wednesday, he encouraged the house to draft immigration reform. Reliably, the president doubled down in tweet. Today, the children are on lock down. The press are not allowed access. The White House say’s 500 immigrant children who were separated from their families at the southern border have been reunited with their families since May. The Associated Press first reported that about 500 of the more than 2,000 children separated had been reunited. A senior Trump administration official the AP spoke with said many of the children were reunited within days. The official wasn’t sure how many of the reunited children remain in custody with their families or how many are no longer in the country. Americans stood up for the children and forced the President hands. Today, the President continues to villainies brown skinned immigrants. He invited families to the White House that have been victimized by immigrants. They stood behind him holding photos of family members. “These are the American citizens permanently separated from their loved ones … ‘permanently’ being the word that you have to think about,” he said. “They’re not separated for a day or two days. These are permanent separations, because they were killed by criminal illegal aliens. Don’t throw away your signs…..
Intense pressure, including from Republicans, prompted Trump to undo his family separation policy. In the face of protests at airports across the country opposing his restrictive travel ban last year, President Donald Trump defended the executive order as a necessary protection from terrorists. When he was confronted with bipartisan outrage and criticism from his own aides after condemning violence on “both sides” of a white nationalist rally and counter-protest in Charlottesville, Va., last year, the president dug in his heels. 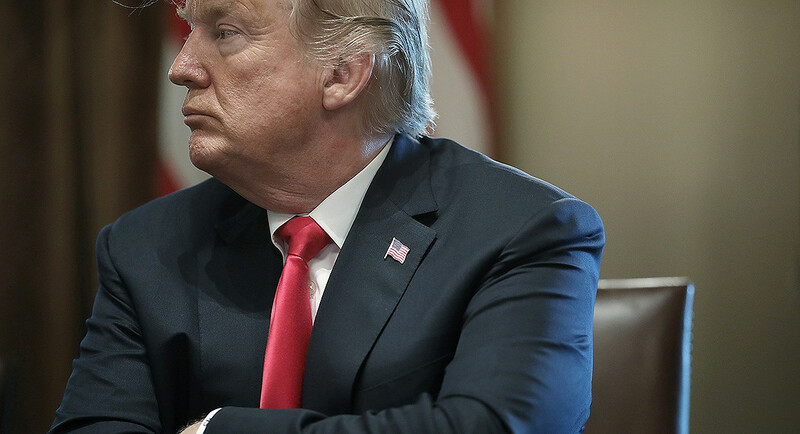 But on Wednesday, facing what has grown into the biggest moral and political crisis of his administration, the president whose default position is to stand firm simply caved in. Sitting behind the Resolute Desk in the Oval Office flanked by Vice President Mike Pence and embattled Homeland Security Secretary Kirstjen Nielsen, Trump signed an executive order temporarily halting his policy of separating children from their parents at the border. The about-face came less than 24 hours after Trump was stridently insisting he was powerless to change the situation, instead blaming Congress for scenes of children caged in former big-box stores. On Tuesday, speaking in front of a business group, Trump even referenced his first campaign speech, in which he called Mexican immigrants rapists and accused them of bringing drugs and crime into the country. His ultimate reversal was all the more remarkable because the immigration and border security has been his signature political issue, one that has energized his political base and helped elevate him to office. It came as a rare combination of forces collided, ultimately moving the stubborn commander-in-chief: political pushback from Republicans in Congress, including typically staunch allies; private pressure from his family members, including his eldest daughter and his wife; and, most importantly, wall-to-wall media coverage broadcasting to the country images of frightened children and the sounds of their sobs from inside government-run facilities. Excerpted from “Rainbow Relatives: Real-World Stories and Advice on How to Talk to Kids about LGBTQ+ Families and Friends” by Sudi (“Rick”) Karatas. Copyright 2018 by Skyhorse Publishing, Inc.
Just in time for Pride in June, “Rainbow Relatives: Real-World Stories and Advice on How to Talk to Kids About LGBTQ+ Families and Friends” (May 8, 2018) is a collection of intimate, real-life stories and advice about coming out to family members—parents to children, aunts and uncles to nieces and nephews, grandparents to grandchildren. The concept for “Rainbow Relatives” was born when author Sudi “Rick” Karatas asked his sister if her children knew about his (their uncle’s) sexual orientation. She said they didn’t, as she hadn’t been sure how to approach the topic and wished there was a book she could read to help her have those conversations. So, Sudi wrote that book. He hopes Rainbow Relatives will make readers more accepting of all people and families, especially in the LGBTQ+ community. I like to view things with a sense of humor (hence the title of this essay). However, it can be a serious family matter when one parent comes out as LGBTQ. 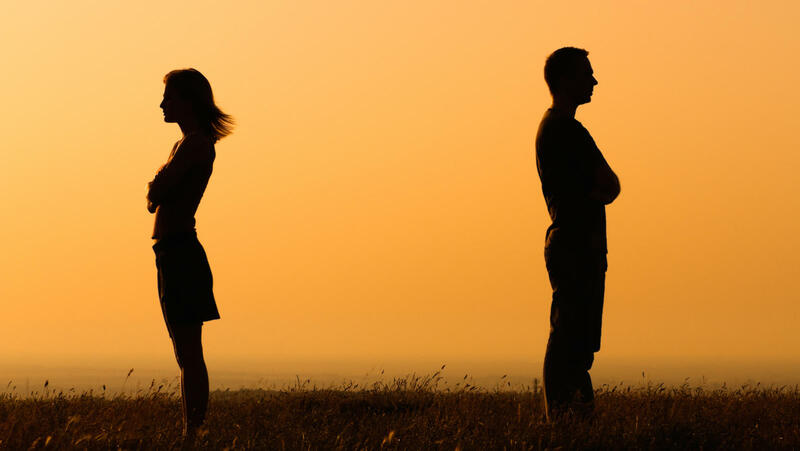 The situation will often result in a divorce, which can be devastating for a child and can result in their conflicting feelings of anger, sadness, confusion, and self-blame. However, while these movies certainly helped to bring the LGBTQ community into popular culture, they did not portray situations that directly involve kids. In 2011, “The Kids Are All Right” became one of the first movies to do so with its portrayal of a lesbian couple raising two children born from a surrogate father. The film won a Golden Globe for best picture and was nominated for an Independent Spirit Award for best screenplay. Hopefully, this has opened the door for more film and television portrayals depicting the reality of children with LGBTQ parents and the common situations that result when one parent turns out to be gay. I spoke with and surveyed a number of other people who had been married and had children when one spouse came out. Hopefully, some of the following stories will help those who are in similar situations, and they will be comforted to know they are not alone. After fifteen years of marriage, Anna and her husband sat down together with the kids and told them about her husband’s sexual orientation. The kids were fourteen, twelve, and eight years old. They were sad and surprised, but they were relieved to know there was a valid reason as to why their parents had separated. Prior to that, no one could understand why this had happened because they’d always had a good relationship together. After a year of being separated from his wife of twenty years, Fred’s sons were visiting him from Texas. At that time, they were thirteen and fifteen years old. He had told his wife he was gay, though he’d never acted on it, and they had decided to separate. However, they had decided not to tell the kids the reason until it came up during his sons’ visit. Sometimes when one parent comes out, their spouse resents it and causes a rift or even sabotages the relationship between the gay parent and child. This may make it difficult for the child to understand and accept their gay parent, but it doesn’t make it impossible. Take Waylon’s experience, for example. Waylon was divorced, and his ex-wife did not take his being gay very well at all. Waylon’s daughter lived with his ex-wife and her new husband while Waylon provided financial support for his daughter but lived in another state. The relationship was strained for a long time because of the negative things his ex-wife would say about him and his sexual orientation. The daughter also didn’t know that other family members had accepted her father for who he was. When Waylon’s daughter was sixteen, she finally visited her dad and his partner, Willie. Not surprisingly, it was a little awkward at first, but he assured her that their relationship wouldn’t change. He asked her if she’d get to know Willie, since he was important to him. She asked questions about their relationship—how long they’d been together, how the relationship was going in general—and she also had her own private conversation with Willie and asked him questions as well. She was able to see that her father’s relationship with Willie was no different from other relationships, and by the end of the day, she had even given Willie a hug. However, once she returned home to her mom and stepdad, the situation became more difficult. Waylon soon got a call from his furious ex-wife, Maybelle. “How dare you introduce my daughter to this lifestyle!” She continued to flood him with homophobic voice mails, emails, and even threats. Maybelle never did come around; in fact, she tried to poison her daughter against her ex-husband with lies about him and used parental alienation to prevent her daughter from seeing her father. The daughter was finally told the truth, and the relationship between Waylon and his daughter (who recently came out as gay herself) is now healthy and strong. I think it’s good that Waylon showed his daughter that he and Willie have a nice, loving relationship that offset the negative things his ex had said. Setting a good example is important. I think when one spouse (in this case, the mother) has resentment toward a divorced spouse, it causes a lot of harm to a child, and if any adult finds themselves pitting the child against the other parent in situations like these, they should, of course, do their best to stop. Pablo’s son was ten and his daughter was seven when he came out to them. Pablo had decided to tell them because he thought his ex-wife was about to out him. He later told his kids that he needed to tell them because he didn’t want them to find out from a third person. He started by saying to them, “I’ve got something important to tell you.” But then he couldn’t continue. Then, both kids started crying. The boy seemed to take it harder than his sister, throwing a puzzle across the room in apparent anger. The crying lasted about fifteen minutes or so, and then later the son suddenly said to him, “Daddy, I’m sorry for those comments and jokes I’ve said about fags before. Don’t take them personally, but I am still going to make them.” It was the boy’s way of trying to use a little humor to break the tension. Pablo said this didn’t bother him too much because if his son felt free enough to make a joke at this time, he felt his son was partly okay with it. Pablo said he also understood the “macho thing” boys have and his reaction was fairly normal. He said, “Of course.” But although the conversation seemed to have resolved things at the time, Pablo told me that his kids didn’t believe that he was born gay for quite a while, and today his son is still not 100 percent okay with it, but their relationship is okay. The daughter is much better with it. I think the takeaway here is even if you fear the kids won’t be okay with this news, it’s still better to be open and honest and give them time to adjust to it. As part of my research, I also spoke with therapist David Giella. He provided some very straightforward insight into what children of gay parents go through in these situations. “In any divorce where, let’s say, the father has an affair, the child may feel the following: ‘You misled Mommy; you made Mommy cry; you had an affair; you have screwed up my life because of something you did; I’m scared and mad at you.’ When the father has an affair with another man, it’s mostly the same feelings, except now the child has to deal with having a parent who is gay, and there may be some shame with this, whether there should be or not,” Giella said. I think what Dr. Giella said is important because parents should be aware a divorce may be a little harder for kids to deal with when it’s because one parent is gay. It’s an additional change and something else to adjust to in their lives; it’s not as simple as their parents not being together anymore. Maybe you know the ways your childhood impacts your relationship(s). Maybe you’ve never thought about it. As an Attachment Based Therapist, I see the impacts of bonds and relationships. From my perspective, strong bonds are what keep us grounded, feeling confident and secure in ourselves and our world around us. I believe, we all need and desire to feel safe and secure; this is what motivates a lot of us. Unfortunately, we get stuck in our (not so helpful) coping strategies that ultimately deny us of this and we often don’t even realize we do this. Especially in our adult relationships. Well… It may be time to start. Here are 5 ways your childhood impacts your relationship(s). Trust is the foundation of any relationship. When we as adults struggle with trusting others, it may be due to deep rooted issues from past ruptures with the people we were innately supposed to trust. If our parents neglected us, abandoned us, abused us, criticized us and/or created a relationship that was conditional, we don’t realize that we innately feel a sense of insecurity as we evolve into our environment and sense of self as we grow. This doesn’t mean our parents didn’t love us– this doesn’t mean you don’t love your parents. This may mean that the tools they had weren’t always effective. Often, our parents “did the best that they could with what they had,” but that doesn’t mean the impact of those tools (or lack of) should be dismissed. It had an impact! If our parents or caretakers don’t give us the unconditional space to be human (i.e. having emotions, mess up, etc), then we start internalizing emotions and start adapting to our insecurities by mistrusting others around us and becoming protective of ourselves in many different ways. What you can do: It is important to understand that trust is difficult for everyone regardless of their past. If you experienced some form of disconnect with your caretakers and/or parents growing up, it’s important to acknowledge and give yourself permission to see how it may have grown into a bigger sensitivity for you and may be something you struggle with even to this day. Acknowledging this doesn’t mean you have to blame your parents for everything; this doesn’t mean you don’t love them; this doesn’t mean you are betraying them. This means you are acknowledging yourself and your needs as a child– which is extremely validating and OK to do. At fifteen, Alice knew she wanted a different life. Her mother was overbearing and very religious, demanding every one attend church. Her mothers world revolved around church. She and her younger sister went to church several times a week. She couldn’t go to he movies, she wasn’t allowed to listen popular music or secular. She had a better relationship with her dad, when see saw him, he had three jobs. He was easier to talk too as long as her mother wasn’t present. The relationship between her mother and father seemed distant, their lives were very different. In High School, she met a boy and fell in love, the boy played football and very popular in school, however his life was very different than hers. He family was middle class and she had a younger sister. He had eight other siblings who lived with various family members. There was no relationship with his mother or father and he and his two sisters lived with his grandmother in a very small apartment across town. While both her parents worked, his grandmother received aid. He worked part time at a hamburger stand near his grandmothers apartment. They had a son. The couple lived seperatley until he found a better job at a hosptial where they were able to afford a small aparment. Neither of them was prepared to be a family. She wasn’t prepared to be a mother and he wasn’t prepared to be a husband or a father. Over time their disagreement turn violent. To escape the violence, she spent extra time with her mother, at one point her mother said she should work it out with the father of her son as it was better to have a man then to be a single mother. Her advice to her daughter was to learn not to make him mad. Her husband was having an affair and rarely home. She didn’t miss him, when they were together there was constant arguing over the simplest of things and the children seemed happier when he was away. The one day she would see him was on Fridays. He dropped money for the family. She had an affair with the clerk at supermarket where she shopped and became pregnant. The man offered her a better life but wasn’t interested in supporting another mans children. One day she dropped off her three children with her mother and never returned. The two moved out of state and started a new life. Without getting a divorce from her first husband, she married again. This man did not hit her or raised his voice. In short order, the couple went on to have four children, one after the other. To save money for their own home, they moved in with his mother. Like her mother, his mother was overbearing. Everything had to have her approval and that included, what she wore and how the children were raised. Her husband never questioned or challenged his mother. Alice always wanted to go to college. When she told her mother in law she wanted to go to college, her mother in law said no. Her job was to be a mother and a wife. She said her son would never agree to it. Alice knew her husband would never go against his mother. So she found a job at a local store. She thought with the job and paying her mother in law to watch the children, she might agree. He mother in law refused. A good friend lent her $300 and with the money she was able to pay for the first semester of college and pay for childcare. One day, her husband asked to speak to her outside. Once outside he slapped her and demanded that she quit school and her job. She refused. Fresh from the slap, mother in law said, he should have put you in your place a long time ago. “You are nothing and if didn’t obey her son ,she and her son would take the children away form her. Weeks later, she returned from work to find an empty house. Everything was gone including her belongings She stayed at her friend until she was able to find a room to rent near her job. Once a week she would go by the house. Her heart ached for her children, when she called her husbands job, they told her he hadn’t reported to work. Several weeks later, she walked by the house and looked inside. It was like she had never left everything was in its original place. When she knocked on the door, there was a lot of commotion in the home. When the door finally opened it was her mother in law who gave her a large white envelope and closed the door. She pushed back on the door began knocking loudly she called for her husband and children. Inside she could hear the children crying and calling for her. She ran to the back of the house hoping to find an open door, she tapped on the windows hoping to see one of the children. As she was running around the house, she ran into a police officer who asked to speak to her in the front of the home. Another officer was talking to her mother in law with her husband standing silent. One of the police officers said, they were told she disappeared after having a mental breakdown and was a danger to the children. What the officers didn’t know her husband had filed for divorce saying that she abandoned the marriage. They told her she was not to return to the home, if she returned she could be arrested after she. In the envelope was the divorce papers. The court appointed an attorney to represent her. Her husband had an outside attorney and currently had full custody of the children. She was asking for visitation since she only had a room in someones home. The court awarded her supervision, and on the first outing, her children were quiet. Her oldest child was told she didn’t’ want them, she wanted a new family, the other children started crying as she tried to reassure them, it wasn’t true. Her other daughter began screaming she wanted to go home, the other children started crying. Defeated, she left sobbing and never asked to see the children again. She finished college with a four year degree. She took a job as representative for a Pharmaceutical company. She quickly went up the ranks and took a job on the west coast. She didn’t contest the divorce and her husband had full custody of their children. Many years have past without seeing any of her children. Though her friend, her eldest child reached out to her. Alice cried, but what would she say to him? She wrote back to him and said told him she loved him but was unable to meet at this time. As time past, she thought about her children frequently. She often fantasize about seeing them all together. But they all probably hated her. She could understand their hatred. What kind of mother would abandon her children? And what if she reached out to them? The first husband like the second had probably poisoned their minds, turned the children against her and what could she tell them without offending them and hurting them any further. She dated, but never seriously, her focus was on her career where she was very successful. She owned a home in Washington and one in Arizona. At 43, she learned she was pregnant. She struggled with the idea keeping the child, she believed she was a terrible mother and she didn’t want to damage the life of another child. However, this time she didn’t know who the father was and no one could take this child away from her and this time she was going to be the best mother in the world to this child. Her pregnancy was challenging ,she was forced to go on bed rest. The child came into the world healthy . She took a less demanding job, with the company so she could dedicate her time with her daughter. In her forties, not only was she a different person she was a different parent. Over time her daughter wanted to know about her father, she kept it real and said, she didn’t know. Through the years her daughter became angry and resentful , if she had a dad, she might have a sister or a brother. The anger grew intense through the years and one day without warning, she told her daughter, she had brothers and sisters. This enraged her daughter who now demanded to meet them. One day, she sat her fourteen year old daughter down and told her the full story. How she abandoned her first three children and how her other four children were taken away from her. The fighting ended between to two of them. The two rarely spoke. Her daughter said when she turned eighteen, she would move away from her mother and probably never see her again. Her daughter was a straight A student and had two jobs. She saved her money and was determined to be free of mother in every way. Meanwhile she wanted to meet her siblings. She demanded that her mother did whatever it took to contact her siblings. For the first time she was forced to face her life. Her daughter didn’t care if her siblings hated her mother. After all could you blame them? Her mother slowly drifted into a deep depression. She was overwhelmed with a reality that she placed somewhere. She was unable to work and sought help. The home in Washington was sold and they relocated to Arizona permanently. The move was especially difficult on her daughter who was more determined than ever to separate herself from her mother. Alice’s therapist told her she would eventually need to meet with all of her children, One child at a time for her life to move forward. She would told to simply listen with no expectations of a relationship. She needed to know how her actions affected her children . She first reached out to her eldest who was now in his late thirties. He did not respond to her letter. She wrote him again and ask if he would give her number to his brother and sister. With the help of an investigator she located two of her children with her second husband. Two her surprise, her youngest daughter with her second husband called her and said she wanted to meet her. Through the younger daughter she was able to reach out to her other children she hadn’t seen in nearly 20 years. She flew her daughter out to Arizona, on route to her home, her daughter asked her for ten thousand dollars. She needed the money because she had fallen on hard times. When she said she didnt have it, because she too had fallen on hard times, her daughter demand that she’d be taken back to the airport, after all she owed her this for what she did to her and that she would never see her other siblings and her grandchildren. Over time she did see some of her children. All where curious, and all were angry and hurt. Some of the anger manifested into rage, and this rage effected their relationships with the men/women and children in their lives. Some of the children had alcohol and drug issues. A lot of her children simply learned to live without her. They attached themselves to mother figures, aunts, grandmothers, mothers of friends. Some where no longer angry. others were enraged. Some despite their successes in life had abandonment issues. Her youngest child successfully met most of her siblings. Some resented the relationship she had with their mother. Others greeted her with open arms. The youngest kept her promise, she moved away from Arizona and started a new life in Chicago without her mother. His hurt her mother deeply. Despite the issues between them, this was the one constant relationship in her life. Twelve years has gone by. A child wanting to see his grandmother reconnect them. Her mother, now in her seventies is different, shes frail but stronger. Other siblings now in their forties and fifty have connected with their mother. Their relationship are friendly and cautious. Some of the siblings resent the other sibling who are contact with the mother. They feel what their mother did was unconscionable. After all a mother fights for her children, she didn’t. it didn’t matter is she was embarrassed and guilt ridden, she is the mother, it her her duty to find her children! In my opinion, the mother was awful and self centered. She abandoned three small children and didn’t fight for four others. We will never know why, she did what she did. If I were one of her children, would anything she said would be acceptable? I don’t know? As we grow older we learn the world is less black and white and more grey. Some of us can look back at our lives, and look at the mistakes we made. None of our lives unfolded as planned. We have misspoke, been self centered at times and over time we become are less judgmental and possibly more forgiving. Possibly because we were able to look at our own shortcomings. Perfection is a myth, if you are a parent your children are often mirrors. You want to look away, but you cant. Most of us survive horrific moments in our lives. Some of us take longer to heal. Other choose not to heal, to move forward, for some reason they need to relive the event. There are many who believe it isn’t healthy to hold on to anger. After it is history, that can never change. Some of us as painful as it was can chalk it up as a lesson. However some of us need the anger and resentment. Need to relive the hurt. Hopefully in time that person might choose to examine the anger and its importance. The question is how do I benefit from the anger? There is an assumption that the perpetrator is without,guilt or shame. The reality is most are. They live with the guilt of their misdeeds, often for a lifetime. I suspect the children who forgave their mother are living healthier lives. It is a nearly impossible hurdle and I’m sure it took time and reflection to get over that hurdle. Its quite possible they have children and like most of us made mistakes rearing their children. Forgiveness is possible, if its something you want.